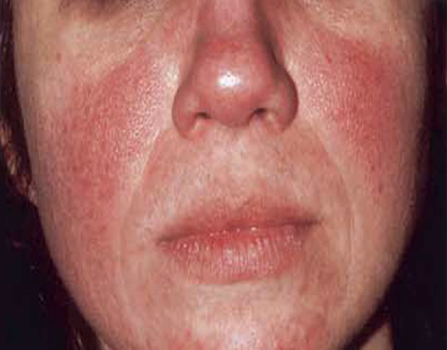 Rosacea is a very common skin condition, particularly in people with fair skin and history of sun exposure. Does your face often look red? Do you blush easily? Do you have unsightly capillaries on your nose and face that you find yourself trying to hide with makeup? The cause of rosacea is not clearly understood but it can often have a major impact on the lives of patients with the condition, and in many cases can go undiagnosed for many years. There are often genetic factors at play and many patients have sensitive skin types. It is particularly common in people with fair skin who flush or blush easily. It can affect people of most ages but is most common in the middle age group where it affects women slightly more than men. Men often experience more severe symptoms. The experience of many people with rosacea is that at different times their skin may become better or worse. Rosacea generally affects the face but can also affect the chest, scalp and neck. Occasionally the eyes are affected leading to bloodshot, irritated eyes and occasionally damage to the eyes themselves. In the early stages of rosacea, patients may notice redness to the skin that comes and goes. Over time this redness can increase and become more permanent. Acne-like pimples and lumps may develop and easily seen blood vessels may be found on the skin. In severe cases, patients can develop rhinophyma – an enlarged, thickened, bumpy nose. Visit Rosacea.org website for useful resources on rosacea. Rosacea will usually get worse unless it is treated. Early and appropriate treatment will often give the best results. It cannot be cured. At Central Dermatology Clinic we understand how distressing rosacea can be. However, our dermatologists can help you to understand your condition and to understand what you can do to help control your rosacea. We can offer patients personalised treatments that can be very effective in controlling both the physical symptoms and the appearance of rosacea. A suitable skin care regime is absolutely essential for people with rosacea. Special prescription creams and gels can be very useful at controlling rosacea in its early stages. More severe forms of rosacea may require a combination of prescription creams, anti-inflammatory medications or other prescription medications to help control symptoms. The redness and visible blood vessels on the skin so commonly seen in rosacea patients are best treated with special lasers. Two or three sessions will often see noticeable improvements with several sessions giving the best results. The recovery following this type of laser treatment is very short, with most people able to go straight back to work after treatment. Talk to our dermatologist about rosacea treatments that can help you.